Marks & Spencer reported adjusted pre-tax profits of £580.9m down 5.4% for FY18 and held its dividend at 18.7p per share. The company reduced net debt to £1.82bn from £1.93bn. PM Theresa May struggled to secure the agreement of her cabinet to a UK/ EU “customs partnership” which would avoid the need for paperwork at UK/EU borders. UK Sports Minister Tracey Crouch said the UK will require betting shops to cut the maximum stake on fixed odds betting terminals (FOBT) to £2 from the current £100 level. Ocado agreed to share its Ocado Smart Platform technology with US retail giant Kroger. Kroger is also subscribing for a 5% stake in Ocado paying £183m or 552p per share. UK Department of Transport took back control of the InterCity East Coast line from Virgin Trains East Coach (90% owned by Stagecoach). Netflix overtook Walt Disney in market value becoming the world’s most valuable media company despite revenues less than a third of Disney’s $55.1bn. Barclays reportedly has instigated early stage merger talks with Standard Chartered. The unconfirmed rumours have hit Barclays shares with investors concerned at the risk of another Barclays rights issue to fund an acquisition. May was positive for UK blue chips helped by the decision of the Monetary Policy Committee to further delay a hike in base rates. Over April investors were convinced May would see the MPC hike to 0.75%. 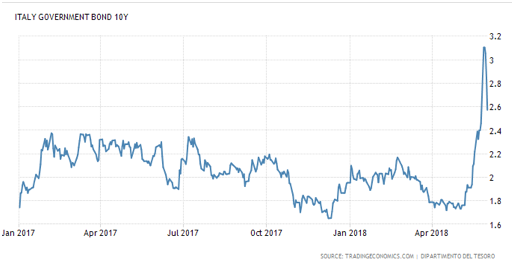 The constant flip flop on base rates sent sterling weaker, along with sputtering UK GDP growth, variously attributed to the weather, was sufficient to ensure the April sterling rally was reversed. The Bank of England has suffered a loss of credibility over this episode. The UK government is struggling to arrive at a solution to the UK/ EU customs problem, as it tries to square “frictionless” trade with its insistence on leaving the EU customs union, which would require checks and tax collection. This thorny issue has run and run since the Brexit vote. Could it result in a challenge to the PM? In our view a challenge could come after the summer recess, Parliament returns on the 4th September. Phoenix Group announced a rights issue of 7 new shares for every 15 held at 518p to fund the purchase of assets from Standard Life. China’s move to cut tariffs on 1,449 categories of imported goods on 31 May was aimed at addressing the $375bn in the China trade surplus with the USA. The US buys almost four times as much from China as it sells. However the tariffs cut were also seen as small in the context of their covering 1.1% of China’s $1.95 trillion in annual imports. The muted movement in Shanghai and Hong Kong equities suggests investor concerns over the disruptive impact of a trade war have for now, abated. The IMF estimates China will grow at 6.6% in 2018 but warned over excessive credit growth. Japan which saw GDP slowdown during Q1 is forecast to grow by about 1.2% over 2018 however this may be revised lower due to the higher oil price and its historically braking effect on Japan. Inflation remains below the Bank of Japan’s 2% target. Shinzo Abe, PM of Japan has warned Tokyo cannot accept new US tariffs on imported automobiles and autoparts that are reportedly being considered by President Trump. This followed a move by Trump last week to launch an investigation into “whether auto imports posed a national security risk” a justification that might be used to raise the duty from 2.5% to 25%. The Five Star Movement, founded by comedian Beppe Grillo in 2009, secured 32% of the vote in the election with their partners, the League holding 18%. The problem is their populist manifesto pledges to end austerity, introduce new welfare spending and tax cuts do not square with Italy’s 132% debt/ GDP. Both parties also have an anti –EU agenda promising tougher migration policies at odds with EU freedom of movement. 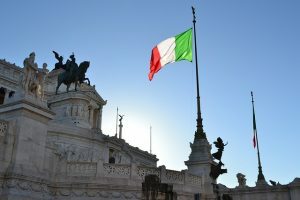 Italy as an EU founder member is not thought to desire a departure from the EU, but it clearly is having a re-think about its rules. How does this obvious impasse resolve itself? Italian bond yields have spiked upwards as investors question the new government’s willingness to service its debts. The 10 year bond yield remains far below the 7% level reached in 2011. This seems to reflect investor faith in the ECB and the fact Italy may be “too big to fail”. 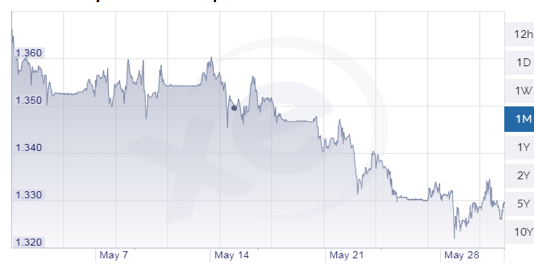 US bond yields had been moving sharply higher, got a respite from the Italy. 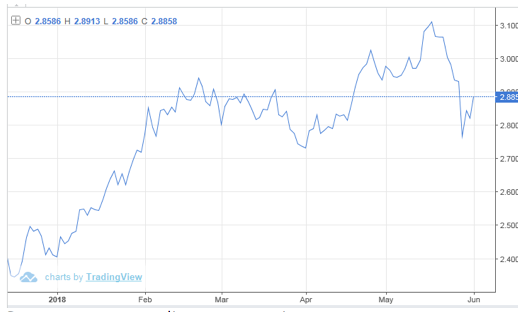 The benchmark 10 year bond declined 15 basis points to 2.77%, its biggest one day fall since the Brexit vote in June 2016. However on balance there remains a 70% chance the US Federal Reserve will lift the Federal Funds rate at its June meeting. Should Fed’s published rate trajectory remain in place that would suggest two further hikes in 2018, in June and December. The fiscal outlook $1.5trn in tax cuts and $300bn in increased government spending suggests sharply higher government debt and higher market interest rates.